1. First off, where are you originally from & How has it helped shape the person that you are today? I was born and raised in Switzerland. Swiss are generally well organized people with curious minds and they are loyal friends. I definitely have these attributes in me although my lifestyle is not always so structured (; I am committed to working in different projects and executing my ideas, I am always studying something (seeking for answers) and I take care a lot of friendships, many of my friends live far away. I live in Brooklyn, NY - I just moved there from Lima, Peru where I lived for the past seven years. 3. Favorite items in your home? Definitely my collection of crystals and I love my bed, it is made of all natural ingredients and coconuts! I just sleep so good in it. 4. Any special projects you are working on or fantasize about? Oh yes! I founded FLOATLOVERS with my friends - a Surf and Yoga Retreat project. We offer 'Journeys' to beautiful and energy-filled locations around the globe. I also study and facilitate Crystal Healing, vibrational medicine is what captures my attention a lot lately. 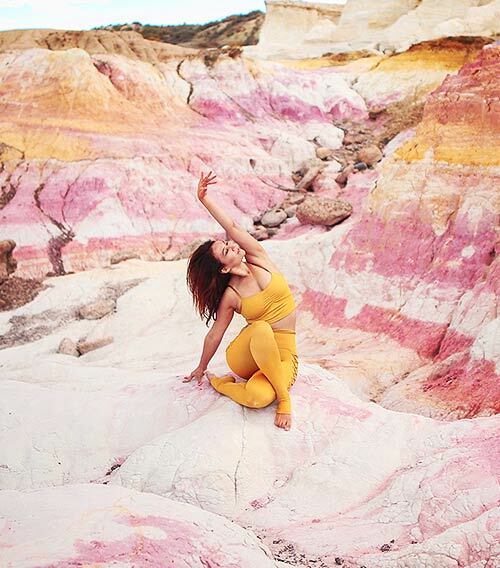 And for the future… I dream about creating a wonderful space, a Home Studio, where I can offer and share all which I love: Yoga, Meditation, Bodywork and Subtle Healing Practices. 5. Tell us more about FloatLovers! Sounds too good! 6. Any retreats coming up soon that we can come to :) ?? The upcoming FLOATLOVERS JOURNEY is taking place from the 13th of to the 20st of May in Nicaragua. This carefully designed private Retreat includes in-depth yoga teaching, magical surf sessions and healthy lifestyle practices. Every participant will receive a wellness-set including organic products and a 7 piece chakra stone set! It is going to be very refreshing and interesting. We still have a few spaces left! Please, feel free to write us. 7. How did you make healing your life’s work? I feel I am just tapping into the world of healing, I wouldn't call myself a healer but a facilitator. I have a lot of respect for the word "healer". But I definitely support people to find well-being, my whole career is based on and about promoting health. I found many ways to do this: this includes creating community, teaching public classes or facilitating Yoga Teacher Trainings - basically introducing people to healthier lifestyles. The individual approach is to work one-on-one, that is a deeper kind of work. My focus is always to empower students or clients so they can activate there own (healing) powers. My work requires courage, focus and steadiness, and very important: establishing good networks and exchanging with other curious beings. 8. What is your favorite part of your work? Creating and holding the space for people so they can become lighter, liberated and evolve spiritually. Really, I love all parts of it. 9. How did you get into crystal healing? Through my therapist in Peru, she introduced me to the crystals and taught me the basics. After that, the crystals found me (they do that!). I brought some home from every place I went. I did a lot of selfstudy and healing on my own before taking a formal training and working on others. I am now certified as Crystal Healing Facilitator with the Crystal Academy of Healing Arts led by Katrina Raphaell. 10. What is your favorite thing about crystal healing? The crystals are powerful, they channel higher frequencies and assist the receiver for the healing. As a facilitator I hold the space for the “soul journey” and help guide through the healing process. That is a wonderful task, because the crystals are my allies! A maintenance plan after the healing can include different things such as yoga or meditation, this is when all my fields come together again. 11. Favorite crystals? Or favorite to work with ? There are so many beautiful stones, they all have their individual properties. Clear mountain quartz is a stone that brings in a lot of light, it is beneficent for all chakras and enhances spiritual growth. They exist in all kind of forms or clusters, for all kind of purposes. I love to work with them, they have also a special significance for me. 12. Any advice for aspiring healers out there? One: Be curious to get to know yourself and keep up a regular self practice. Two: Do healing from the heart space and with the purest intentions only. Three: Stay grounded, rest and find ways to restore your energy. 13. What is your advice for people wanting to start a meditation practice? Try guided meditations online or join a meditation group. Find out what fits you most and into your lifestyle. It is good to have a guideline or a guide in the beginning. Start meditating a short time daily (10-15min). Sit upright, with a lot of pillows/blocks if necessary (the body shouldn’t bother you at all). Be compassionate with yourself, don’t judge just your practice, write down your intentions or what holds you back from staying focused. 14. You had a photoshoot recently with Mika and it was amazing! Any favorite shots from the day?? Yeah, that was so much fun! I enjoyed our little group of creative and empowered women, each of us doing our best to make it happen so nicely. My favorite shot is one posing with a very old skyblue car, the street is colorful and looks like we were in Cuba. 15. Favorite place you have traveled? Indonesia and the Atlantic Coast of Costa Rica. 16. Live anywhere in the world… where would that be? It is still unreal for me that I am in New York now. But it is great, I am happy, although I know I am not going to be there forever. The ocean calls me, I want to settle down somewhere at the oceanside, maybe in Costa Rica. 17. What do you love most about yoga? Yoga is an amazing tool to transform and heal our bodies (Yoga Asana), learn how to focus our mind and deal with emotions. It made me become very clear, know myself better, be more sensitive and conscious. And it definitely was an entrance point to access higher realms of reality. Everybody can practice Yoga, there is so many ways to do it, thats the beauty of it. 18. Favorite way to de-stress? Laughing with my husband about stupid things. Honestly, my apartment in Brooklyn. I am a very domestic person. I met my husband in Bali nine years ago. Since then we are in love I guess. He is also the reason why I moved to Peru. It just feels right, we bring out the best of each other. And we enjoy surfing together. It just flows. I am very grateful for this connection.